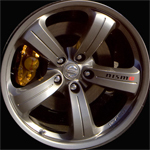 Because so many styles of OEM wheels were available on the 350Z throughout its production I thought it might be time for a list of the wheels with images and their physical characteristics. Touring Version One from Performance & Touring models from ’03 – ’05 (18×8 30mm offset / 18×8 30mm offset) The front and rear wheel sizes are the same, in order to keep the VDC happy the stagger comes from different tire sizes. Do you own a 350Z? Join us in the Nissan 350Z Forum!